Bring On The Bad Guys (1976) | 'TAIN'T THE MEAT… IT'S THE HUMANITY! The third Marvel/Fireside Books team-up continued the best-selling formula established by the series’ previous entries, Origins of Marvel Comics and Sons of Origins of Marvel Comics, but this time with a twist. 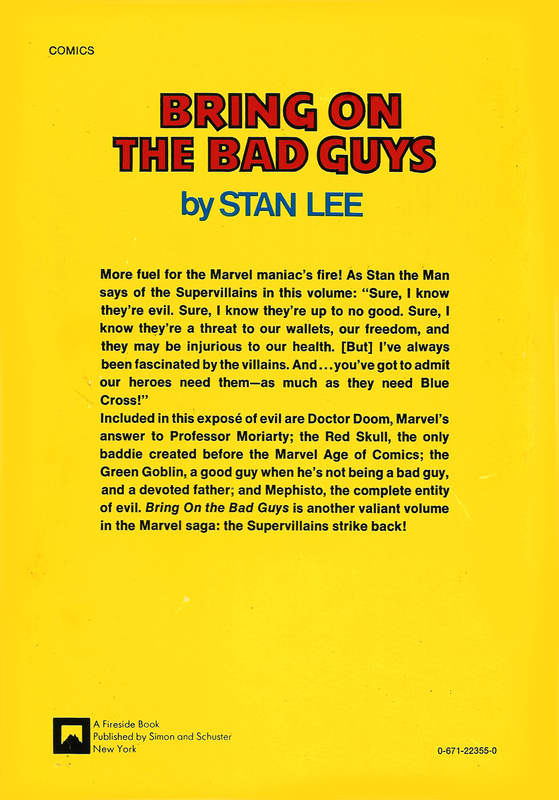 In Bring On The Bad Guys by Stan Lee it’s not Marvels Comics’ superheroes who grabbed the spotlight but rather their nemesis. 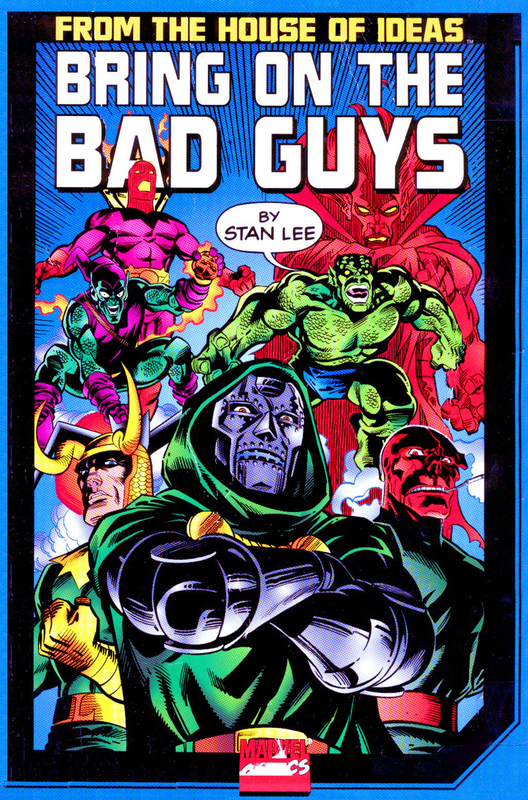 Published in October 1976 the book reprints the origin stories to seven of Marvels greatest villains: Doctor Doom; the Dread Dormammu; Loki; the Red Skull; the Green Goblin; the Abomination and Mephisto. Each character featured in their own chapter with accompanying text by Stan Lee, who explained the genesis and inspiration behind the characters creation. Lee’s introductions are short and to the point; they featured his usual chatty banter and, while he’s entertaining, you can’t help but feel that you’re reading a fairly romanticised version of how the characters were created – I suspect then truth is probably a little more mundane and workmanlike. The book is still a good read though, with the Dr Strange stories and the Loki origin tales being amongst the highlights. 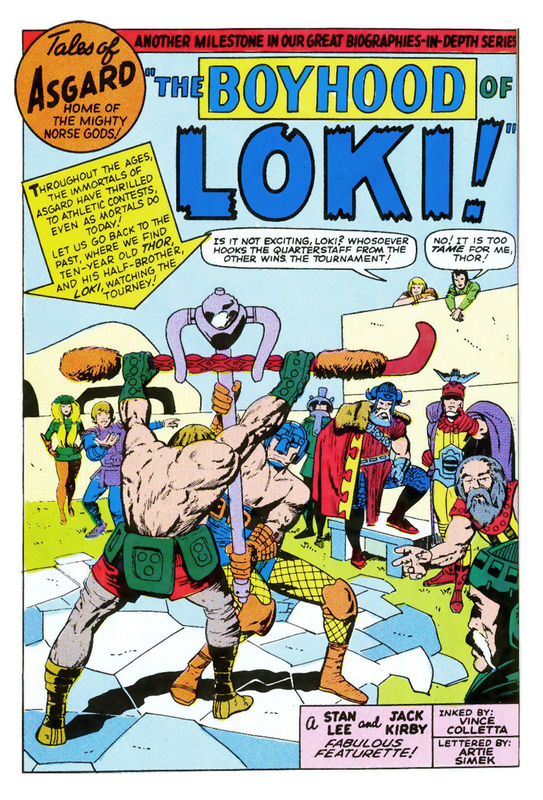 For the latter Lee and Jack Kirby explore the characters jealousy and anger in depth and provide a real insight into the character’s motivations. 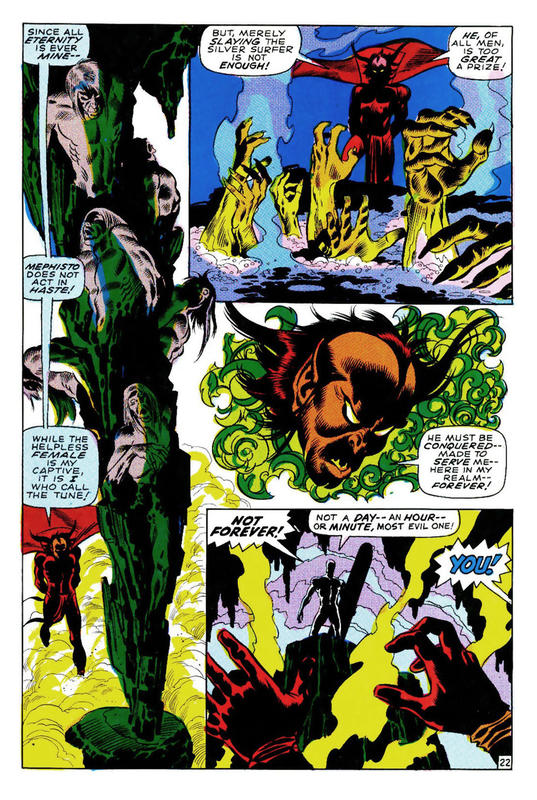 The book features reprints from the following comics: ‘Prisoners of Doctor Doom’ from The Fantastic Four issue #5 (July 1962); ‘The Fantastic Origin of Doctor Doom’ from The Fantastic Four Annual #2 (November 1964); ‘The Domain of the Dread Dormammu’ from Strange Tales #126 (November 1964); ‘Duel with The Dread Dormammu’ from Strange Tales #127 (December 1964); ‘The Coming of Loki’ from Journey Into Mystery #112 (January 1965); ‘The Boyhood of Loki’ from Journey Into Mystery #113 (February 1965); ‘A Viper in our Midst!’ and ‘The Vengeance of the Thunder God!‘ from Journey Into Mystery #115 (April 1965); ‘The Fantastic Origin of the Red Skull’ from Tales of Suspense #66 (June 1965); ‘Lest Tyranny Triumph’ from Tales of Suspense #67 (July 1965); ‘The Sentinel and the Spy’ from Tales of Suspense #68 (August 1965); ‘Spidey Saves the Day!’ from The Amazing Spider-Man #40 (September 1966); ‘The Abomination’ from Tales to Astonish #90 (April 1967); ‘Whosoever Harms The Hulk…!‘ from Tales to Astonish #91 (May 1967) and ‘The Power and the Prize’ from Silver Surfer #3 (December 1968). As enjoyable as these stories are, there are a couple that don’t really fit the ‘origins’ tagline of this series: neither the origins of the Dread Dormammu and Mephisto are told in this volume, just the first issue in which the characters appear. I can overlook that though as the stories in those two chapters are terrific – Steve Ditko is at his surreal best with the Dr Strange stories and John Buscema in on top form in his Silver Surfer tale. One way in which this book differs from it’s predecessors is the inclusion of chapter introduction pages featuring full-page renditions of the villains featured. The artwork used is mostly recycled from other stories but some, like John Romita‘s Red Skull, was specifically drawn for this collection. These chapter pages are a nice touch and are repeated in the fourth – and last – volume of Fireside reprints, The Superhero Women. Apart from that it’s business as usual for this collection, which features an eye-catching cover by Romita and clocks in at a generous 260 pages. Bring On The Bad Guys was reprinted in 1998 sporting a rather naff cover and a change in story line-up. 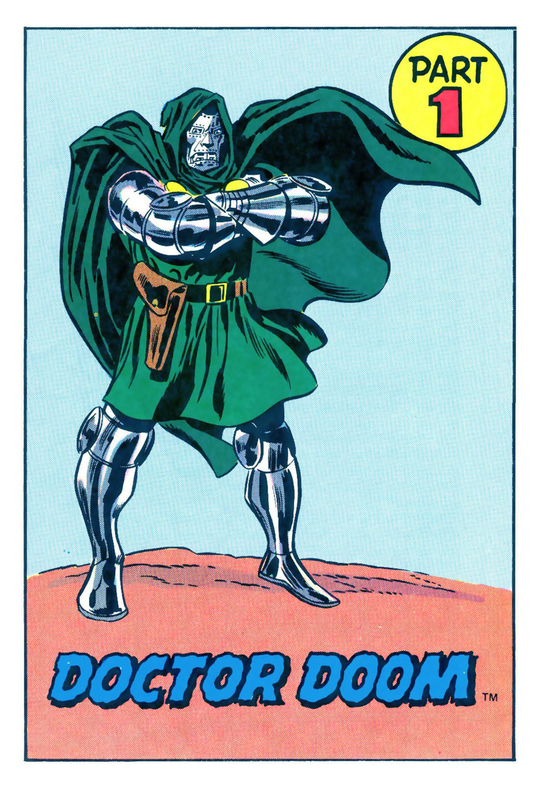 For this new edition the Doctor Doom story (‘The Fantastic Origin of Doctor Doom’) from The Fantastic Four Annual #2 was replaced with a retelling of the character’s origin written and drawn by John Byrne from The Fantastic Four, issues #278 (May 1985) and #279 (June 1985). To fit this longer story into the books page count ‘The Vengeance of the Thunder God!’, from Journey Into Mystery #115, was dropped. 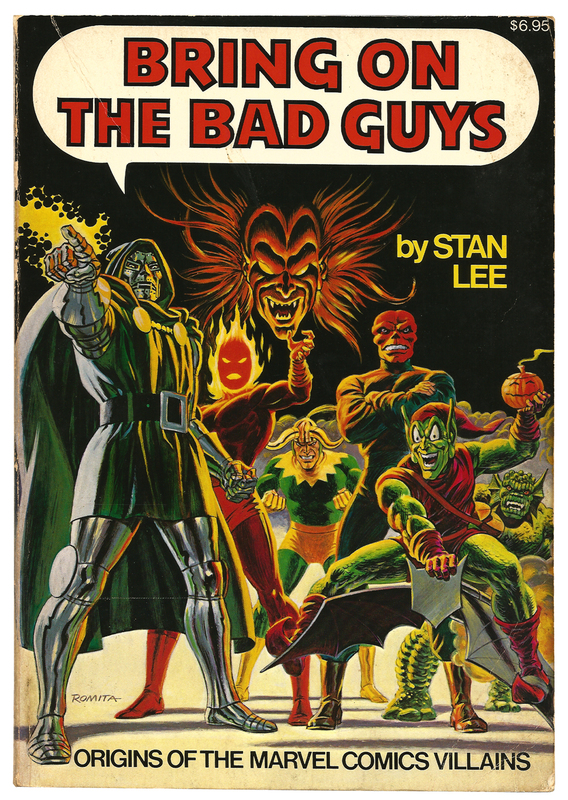 I’m not convinced the change in line-up is necessary and, personally, I prefer the original 1976 version and its painted cover by John Romita, Sr.
Bring On The Bad Guys by Stan Lee (1976 edition) is long out of print but second-hand copies are readily available from Amazon Marketplace for around £15.